» Home » Apple Festival 2018 was a huge success! The 27th UBC Apple Festival was a huge success thanks to more than 18,800 visitors and volunteers that participated in festivities at UBC Botanical Garden on Oct. 13 & 14. Beautiful weather made for an exciting all-ages celebration of B.C.’s beloved and rare apple varieties. This year’s festival generated over $80,000 in revenue that will be used toward education, research, conservation, outreach, and public display after event expenses. 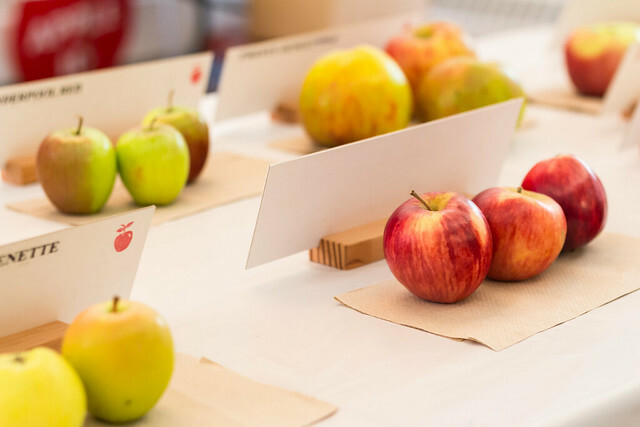 UBC Apple Festival aims to be a zero-waste event. This year, over 18,000 litres of waste were diverted from landfills at the festival. Zero-waste planning will continue to be a priority for UBC Botanical Garden in the planning of Apple Festival and other events. We are working with our vendors to bring our landfill production down to zero. Over 63 varieties of apples and over 70 varieties of apple trees were sold. The celebration also featured family-friendly entertainment, live music, a children’s area. The event also hosted 21 food vendors, 5 craft retailers, and 2 community groups. UBC Botanical Garden’s Apple Festival could not be possible without the hard work of the Friends of the Garden (FOGs) volunteers. We thank the FOGs for organizing and hosting Apple Festival. We would also like to thank our media sponsors from CKNW and Global BC for their generosity. UBC Botanical Garden is on the traditional, ancestral, unceded territory of the Musqueam xʷməθkʷəy̓əm people.